Gazelles and their relatives are important game animals in Africa and Asia; they have been successfully introduced into the US and they are also kept in zoos throughout the world. 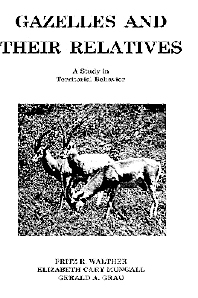 The occurrence of territorial behavior and its importance for the reproduction of gazelles has been recognized for some time; thus specific information on their territorial behavior is desirable both for scientific and for practical reasons. This book provides the first concrete information on territory size and shape, duration of territorial periods, reoccupation of territories, phases of territoriality, the process of becoming territorial and of abandoning the territory, favorable and unfavorable environmental factors for territorial establishment, and territoriality as antagonist of migratory behavior. Also included are many previously unknown details of traditional territorial behavior, such as differences in the aggression of owners of territories toward (male) conspecifics of different age and social class, the structure of a marking system within a territory, etc.